Baby steps of advertising - Blog | Block&Roll - Lets Block&Roll! Our new blog is up! Let's begin with the beginnings. We'll take you through the first versions of today’s most common channels of advertising communication. When we take a look at the first print ad, if we know anything about this business, we'll experience one of the two possible reactions. One of them is disbelief: „My God, this was advanced!“, and the other one is resignation: “Literally nothing has changed since the MIDDLE AGES”. During the rule of the Sung Dynasty in medieval China, a bronze plate was used for making an imprint on a square sheet of paper to advertise a fine needle store. In addition to the usual sales copy, it was written: "Recognize the white rabbit as our sign - please remember the white rabbit" which indicates an unusual awareness of the importance of branding. Remember, this print originated sometime between X and XIII century. At one point, the print ads decided to come out and spread onto the streets, specifically in the bohemian quarters of Paris. The night life plethora was announced by the fascinating posters of Jules Chéret, also known as the father of a modern poster. Chéret's posters were so popular that girls on them were called Cherettes. The development of advertising in America was accompanied by a characteristic social dynamics, in which profit battled with puritan morale. It is not difficult to guess who had won. Until the beginning of the 20’s of the last century, an ad would sneak into the radio program now and then, mumbled by a speaker that would drink his fee in a nearby bar. Then, the state took matters into its own hands, and in February of 1922, the US telecommunications company AT & T gave air time at its main WEAF radio station in New York to the Queensborough Corporation for the purpose of advertising a new residential complex in Queens. Soon after television advertising became legal, the first TV commercial appeared. It was broadcasted on July 1, 1941, before the baseball match between Brooklyn Dodgers and Philadelphia Phillies on the New York TV station WNBT. This “mistake” was paid by Bulova, a watch and jewelry manufacturer, in total of 9 dollars (today about $ 150). At that time, there were 4,000 TVs in America, and only a few hundred viewers saw the ad, at best. The first case of advertising spamming was carried out in May 1978 by marketing manager Garry Tuerk, the notorious spam father. 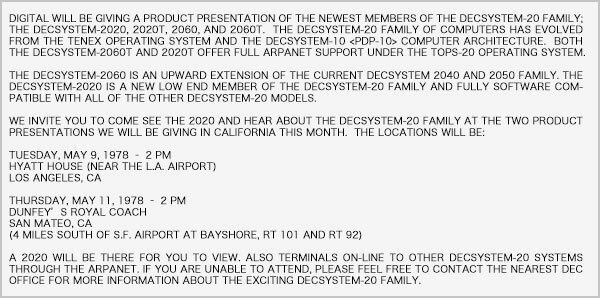 In an effort to acquire users of digital equipment on the West Coast, Garry sent an invitation to present the company's new product at so many addresses that the US Department of Defense has banned spam for the next ten years.